Sterling, VA (October 24, 2007) ... At K 2007 in Dusseldorf, Germany, Gammaflux will introduce a new process control system that combines the best of its hot runner temperature control technology with the PRIAMUS Fill & Cool system. The result is an integrated package that helps molders achieve balanced fill in their multi-cavity hot runner molds. "We believe that with the introduction of this new product, Gammaflux has taken the next step in process control," said Rene Bertschi, Managing Director, Gammaflux Europe GmbH. 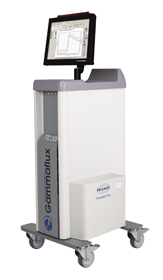 "The TTC-eDAQ 8102 combines proven technologies from Gammaflux and PRIAMUS that will help molders improve quality and increase productivity." The new TTC-eDAQ 8102 uses cavity temperature sensors to detect melt flow characteristics in each mold cavity. This information shows any variations in cavity fill times by comparing the temperature curves from each cavity. The TTC-eDAQ 8102 then automatically adjusts the timing of the filling of each cavity by changing the cavity temperature setpoints in the TTC temperature controller. This causes all cavities in the mold to fill as close to the same time as possible. PRIAMUS speed of sensors and electronics coupled with the accuracy of the Gammaflux TTC temperature controller combine to provide dramatic improvement in part quality and consistency.